Joanne absolutely blew me away with how simply she transformed an out of control 1yr old chocolate lab into an obedient family member in just a short period of time. She came out on Sunday and worked with us for only a couple of hours. Today is Wednesday and this has been the easiest training ever. Brandy is doing great! Thanks! Joanne was absolutely wonderful! She gave my husband and I training techniques to use on our dog and so far everything is going great! 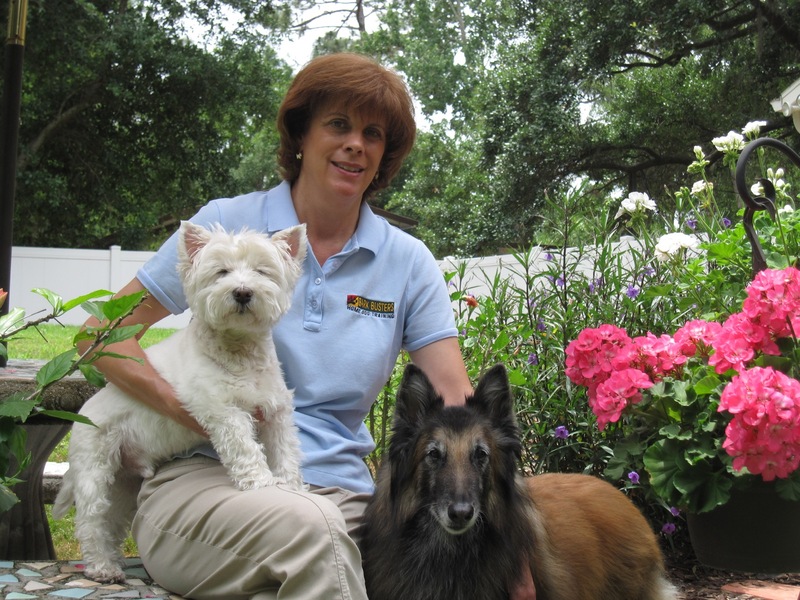 Joanne Rice is a fantastic dog trainer who helped us make a markedly positive difference in our dog. Enzo is our little boy. He's a year and three month old standard poodle with tons of energy and lots of anxiety. We love him so much but were quickly getting tired of his separation anxiety. Whining, crying, and destruction were becoming common place. Joanne helped us understand why Enzo felt the way he did, what he was going through, and gave us tools to use to help him overcome this problem. The great thing is, dealing with this issue has translated into Enzo being more disciplined and obedient in every other aspect of his home life. We were extremely impressed at how significant the changes were and how quickly they came. We noticed an immediate difference in his behavior and general disposition. No more following us around crying and no more destruction. He has become such a great dog! Dogs want to please you and be good for their owners, the trick is understanding how dogs think and communicate. Once you uncover these things, the sky is the limit. 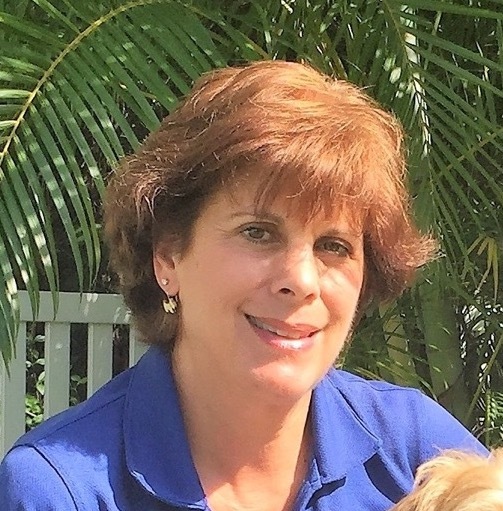 Joanne will help you learn the secrets of your dog and help train you how to train your dog! Your furry family members deserves having the order and structure they need in their life and you deserve a good dog! 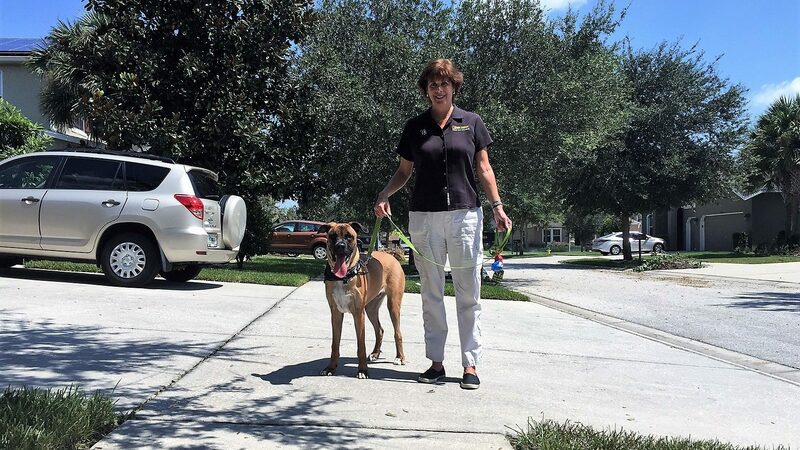 Let Joanna help you and your dog grow together. We highly recommend Joanne and give her five stars! Complete process was easy to understand, easy to pick up and execute. Overall I found the system to be an excellent source to refer to for further training, I would highly recommend to others. My session with Joanne was very productive. She addressed all areas of concern with clear instructions and much needed coaching. Body Language 100 and Doggiebonics 101 are just the classes I needed to talk the talk and walk the walk. For the longest I've raised dogs and clearly I was doing it wrong this whole time. I need to be in charge and in control of my puppy so he doesn't walk all over me. I appreciate Joanne so much for teaching me simple things to help my everyday struggles with Goose. Thank you so much! The techniques were a God-send!! I was at my wits end with Lexi. Now it is so much fun to watcher her grow and progress. Joanne was very patient and informative which taught us a lot that we did not know and needed to know. Excellent. Joanne was amazing! Initially we were hesitant about the training due to the cost, but just after the first session we could see that it is worth every penny! Our first lesson was lots of information and so helpful to start. We immediately saw big changes in our dogs behavior. We love that we can call Joanne with questions and always have her expert opinion when we need it. We are currently on track for our follow up appointment and we can't wait to see what comes next. Our puppy is responding favorably to the new house rules. Joanne taught us so many things. We didn't even know what we didn't know. It's only been 2 days since Joanne has come to the home and we are already noticing an improvement. Joanne explained to us clearly and thoroughly about the mind of a dog and how to establish leadership. At this point it's about reinforcing behaviors we want to see and controlling those we don't want to see. It's great to have this support and to feel as if we can get a hold on our dogs' issues. We adopted a 1 year old dog in the last month and I was second guessing myself. I have 3 young children and some of her puppy behaviors were not going to work unless I could get control of them. Once I had Joanne come and teach me how to be the leader of my dog, it was a world of a difference. I couldn't believe totally when I was told over the phone that my dog would be different with one session, but he was right. I now feel as though I am in control of her and we can now enjoy her and trust her much more! Friends who have come over can't believe she's not jumping and acting so over excited with all the kids anymore. WORTH EVERY PENNY! It was amazing how after the first visit I could see changes. Joanne is great . Just stay focused do your homework, and you'll have the dog behavior you always wanted. Joanne was great and helpful. Our dog really responded well to the training. His behavior has already improved. We are very grateful. Joanne was wonderful. She was professional, thorough, and trained me well! My dog now knows what I want and obeys most commands. He does great until people are around and he gets excited and forgets some of his training. But he was quarantined for 3 weeks, so that will be resolved as we get him around more people. I was thinking about returning him until Joanne showed up with her magic! Thank you for helping me keep my pet...I am thrilled with the outcome. The training session was very helpful, Joanne Rice was very professional and Spencer seems to be responding to the exercises Joanne left for us. Joanne Rice was courteous and a pleasure to work with. She is very professional and I believe working with her will provide our Bella with an attitude and temperament to be well adjusted as a puppy and into her adult years. Blaze is doing great. He has acclimated to his new home and new way of life. No more chewing on door frames or barking; his Kong and Game Changer take his mind off us leaving, and then he retreats into his bed. And we have been leaving through the garage door for the past 2 months without issue. He has also spent a few nights at CBW; they love having him and say is a 'leader' among the pack. Thank you again for the transformation. He loves his new home. Joanne was very professional and helpful in more ways than one! She helped us to set up our training program for Abby. But more importantly, helped us set up house rules for our grandsons. They love the new puppy but get Abby over excited. Then they get upset when she scratches and bites them. So we saw immediate results with our puppy and our grandsons! We are looking forward to our next appointment! Joanne was great. Charlie is already making significant improvements. Insightful and very professional, Joanne is an excellent trainer who is very thoughtful, patient and courteous. Joanne is a true professional! All of her techniques and exercises have had almost immediate impacts. Thorough and patient, she does a terrific job of demonstrating and letting us practice. In just 2 visits, she has completely enhanced our relationship with our dogs. Could not be more pleased. Our first experience with Ms. Rice was very positive. She delivered excellent info and demonstrated basic techniques that were immediately helpful. Mostly we are now focused on puppy behaviors that we are looking forward to changing. Joanne made it seem so simple and explained things so well. We were surprised how quickly we saw results. Joanne was very well prepared, professional, and personable. She gave us a thorough presentation, answered all of our questions, and demonstrated all of the training instructions. Our puppy, Harper, responded well to Joanne and while we felt a bit overwhelmed with all of the training guidelines, the printed instructions helped us to refocus on the key items after she left. Overall, we were pleased with our introduction to the Bark Busters home dog training program. We are looking forward to seeing great results with our new puppy. Cici was a very unmanageable pet when we first got her. 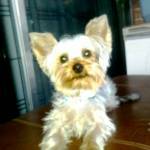 Joanne was very helpful right away in helping my wife and me change Cici's behavior. We were getting her to respond very quickly with the training Joanne provided. This is the first trainer we have had that helped us immediately with our dog. Thank you Joanne. We are looking forward to more possible growth and behavior from our girl Cici. Joanne gave me great directions on how to correct Laila's problem areas. I took Laila for a long walk after she left, and I walked Laila instead of Laila walking me. Since Joanne came to our home, Laila's behavior is already like night and day. We are committed to the program! We learned a lot from Joanne and Josie has already made great improvements. We are really grateful for all of Joanne's help and knowledge. After Joanne's first visit, I saw a difference in Shelby. The techniques she showed me definitely helped. We are still in training, but I am thrilled with the results I have seen. Thank you Joanne! Very interesting. I learned a lot. 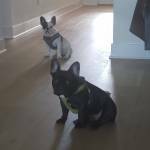 My dogs' behavior improved greatly in the 1st week! I have already recommended Bark Busters to other people. We were surprised to learn how to communicate with our dog so quickly and see results immediately. As I write this - 2 hours since Joanne left after our first training - I am aware of how quiet my house is! I have tools and strategies to lead my dog and my husband and I have a specific common game plan and action plan. We will keep working with our dog to reinforce her success. Joanne just left our home from our first session. Our unruly & high spirited Irish Setter is already calmer, focused and attentive. My only regret is that I didn't call sooner! We are off to a good start! Milo responded very quickly to door control and as of day 1 he waits for us to go out of rooms and doors. Leash training is going better but we have work to do on pulling/stopping. House training is going well-first 3 days I was skeptical because he pooped every singe day! Since then no pee or poop in the rooms he has access to. Joanne was very professional and efficient. 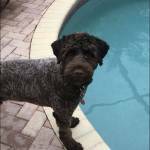 The training methods that she taught me and my husband seemed to work well with Hoda, our dog. As expected, long-term success depends on our diligence in following through with the training. So far, we are pleased with the Bark Busters method of training. So far we've only had 1 session but I see a pretty significant difference after a day! I have to review my materials tonight so that I do things the right way. There's a lot of info to take in. Joann was very professional and I really appreciated her input. It was so nice to get reassurance about things we were doing well. This pup of mine is super smart, so I am glad we invested in proper training. Twelve years is a long time to have an animal that drives you nuts! Joanne was prompt, knowledgeable, and most importantly, a GREAT teacher. As a teacher of teachers, she knows how to get the students to learn as opposed to telling only. We saw IMMEDIATE results. !! Thank you ! Joanne was awesome. I have complete faith that our dog will be trained. Thank you!! Most of the issues addressed have shown quick improvement. Joanne was very thorough and explained all instructions with clarity. The steps are very simple yet the results in most areas were immediate. Joanne has helped my parents and their rescue so I immediately knew who to turn to when I adopted my own. We have only had one session and I already see improvement. I can't wait to continue our training with Joanne. Very thorough. Joanne explained everything in detail and allowed all family members the opportunity to model to ensure we were getting the steps correctly. Sophie is a work in progress as she is a puppy, but we have already seen a huge difference in her behavior. We called Bark Busters after we added two new rescue pups to our family. We already had Fruitkake, a rescued Chihuahua/Min Pin mix, who is now 13 years old. We added an American Bulldog, Ferrigno, and an Australian Stumpy Tail Cattle Dog mix, Favola. Our Ferrigno, was a particular challenge, because he is mostly deaf (he can hear VERY loud noises or high pitches in his left ear) and has vision problems. His sensitive skin did not permit the use of a vibrating collar and although he was doing well learning signs for basic commands, we could not always get his attention. Both Ferrigno and Favola had poor manners overall and were digging up the yard whilst playing. Joanne was able to show us how simple it was to correct their bad manners and behaviors! We were amazed at the improvements - just after one session - and the techniques employed were so simple! Now we are very proud of our pups and can enjoy a much calmer life with them. . . . and Ferrigno? Well, we can take him anywhere! With the training tools Joanne showed us, we can now recall him with a whistle, but its not usually necessary because he constantly watches us for clues and signals - even at the dog park, he stays close to us and 'checks' to see if we are trying to get his attention. We highly recommend Bark Busters and can honestly say the training techniques employed work miracles! We applied what we learned at the lesson and found success right away. It all made such good sense and we loved that the dogs never felt threatened, just disciplined. They obeyed well. Joanne reviewed and clearly explained the procedures we will be using to train Peyton. We started work on communicating with Peyton at the door and how to walk by our side on the leash. Her explanations were clear and she demonstrated what we need to work on as well as having us do the work with Peyton. It's only day two, but seeing results already. Immediate results. Very pleased ! Joanne was positive, supportive and patient when it came to discussing our concerns. She is very knowledgeable and gave us the tools to be successful. We really liked how she demonstrated a task, left the house so we could perform the task without her. That way our dogs were responding to us right away. Joanne made sure to cover/answer all our concerns, but she is also available at any time. Joanne was great to explain all we needed to know in the beginning stages with our new puppy, Zoey. The advice we received made a ton of sense and gave us concrete tools and steps to work towards our goal. We are very, very pleased. Joanne, you coming in and sitting and explaining things to us and why Harley was acting like he was a wild dog helped us so much. You were like a breath of fresh air! You gave us hope! I can't thank you enough! We actually saw results the 1st day!! Every day seems to get easier. I know he has a ways to go and the puppy will be there for a while, but we can begin to enjoy him instead of dreading having to fuss and yell at him. I felt so sorry for him because it seemed everyone was telling him no constantly! He seems much happier and I know Dan and I are! Every day Harley gets better and better! He is a very smart dog. We all just have to learn new things. Who said you can't teach an old dog new tricks? You certainly have taught us new tricks!! Thank you. Very nice trainer. So far everything is working out. Borris became much more manageable. Learning so much and it's been very helpful! Joanne is exceptionally friendly, knowledgeable and professional. We're lucky to have her. Joanne really helped us and I look forward to her assistance as our puppies grow. Brady has responded to the training very well. The suggestion of doggie daycare was great as well. He he is in the crate, by making him sit & stay before he comes out really calms him down. Joanne made the program very easy to continue. Wish we would have had he training earlier. The once a week training with other dogs present & at a strange location did not help at all. Joanne was extremely helpful in teaching me how to manage my dog's bad habits. She made me feel more confident as a dog owner. Thank you so much Bark Busters. This program makes sense. Practice makes perfect. Joanne is very knowledgeable and calm. We LOVED the training that Joanne provided. We have already seen great improvements in our 15 week old puppy. We were doing so many things wrong to correct his behavorial issues (biting, jumping, etc). The very easy and simple commands Joanne taught us in just a couple of hours have worked tremendously. I have a 7 year old papillon who has a lot of separation anxiety. He barks when I leave, when I get up to go to the bathroom, you name it. But when my dog decided to "pick" my boyfriend to sleep on all night (rendering some sleepless nights for the boyfriend), I knew I would have to crate train him even though he's never been crate trained. Joanne came to my house and said, "Oh no, we can train him to sleep in a dog bed. You don't need to introduce him to a crate." And to that I said, "Yeah right." He has never listened to a word in 7 years...he won't start now! I was prepared for lots of barking and howling and crying. Boy was I surprised. Joanne was with us for two hours teaching us some sensible training tricks. I thought it would take months for my dog to change. In just 10 minutes, I had him obeying commands. ONE DAY, and my dog is not only sleeping in his own dog bed, he also has stopped barking when I leave, when I enter the room, any time I leave. Joanne has taught us how to show our dog we are the pack leader. It turns out my dog thought he was in charge of us, and it caused him anxiety. (Joanne says thats a big responsibility for a dog!) Now he knows his job is to be happy and listen to his pack leaders. This hasn't just changed my dog's behavior, it's changed our lives. If you have a dog with separation anxiety, you'll know what I mean. Joanne was worth 10 times what I paid. I will recommend her to everyone with a dog! It was literally magic. Thank you Bark Busters! We hired Joanne Rice with Bark Busters to train 'us' on the best way to train our new German Shepherd puppy, and to provide some advice on how to handle my 3 year old female who goes berserk when bikes and joggers go by. Regarding the puppy, he's so well behaved using the techniques Joanne has provided to us - he's going to be a well behaved good K9 citizen. My 3 year old is going to take some more work but I believe with the various tools and techniques provided to us she will come around too. I wish I got in touch with Joanne when we got her as a puppy! I would recommend Bark Busters to anyone who wants a happy and well adjusted dog. Its amazing how quick the dogs respond. As long as I keep with the training, the better the results will be. Thank you Joanne, we really appreciate your guidance. Joanne was great! Our puppy (Chocolate Lab) has responded immediately to the techniques she presented and we are looking forward to further development of both our puppy and ourselves. Ellie is a different dog!!! We can't believe some of the simplest techniques work so well. Thank you for your help and giving us a perfect companion. I was at the end of my rope with Piper not listening. We saw noticeable improvement immediately. She responded to it better than our previous efforts. Life saver! Cami responded very well and our life is so much easier because of the training. Joanne is wonderful! I cannot praise Joanne's skills enough. We brought home a 4 yr old shih tzu from the Humane Society. He was not house broken, was not good on a leash, had aggression issues. We were afraid to let anyone touch him that came to the house First time i took him to the vet she came to greet him and he snapped. We wanted to keep him but were desperate what to do. We called and got an appointment with Joanne. She worked with us the first lesson on his issues gave us lots of good guidelines and training methods but more than that something about her makes the dog understand he started to change after that first lesson. He is now our precious little Poppie. Using the training he is house broken, he is so changed when I took him to the Vet all they could do is remark how he is a totally different dog. He was friendly let everyone pet him. The transition is remarkable. We had her back once as he was still having some aggression towards other dogs when walking on a lease and he has improved in this area also. I would highly recommend Joanne to anyone she is remarkable. He was excellent after one session! He was like a new dog. Although it is us as the owners that had to enforce the change. The money up front is a lot but I believe worth it! Joanne is great and listened to our concerns. Would recommend to anyone. We are very happy with Joanne Rice and Bark Busters. We learned a lot at our first meeting. We have already recommended her to 4 families. The training was excellent and Whisper has done very well. I would definitely recommend Bark Busters to family and friends. Joanne was very helpful and provided great insight to training our puppy. Our 1st session was very informative and helpful. It's still early, but we can already see some changes in our dog's behavior. Looking forward to seeing great results! Joanne and the training techniques were wonderful. We saw major improvements within minutes after being taught how to assert ourselves as the pack leader. We are extremely satisfied after believing nothing would help our overly energetic and constant attention seeking Golden Retriever. Joanne is great. Timber is a special case - a hybrid wolf without adequate socialization and a great deal of anxiety. He has done great in the training. Joanne's training was wonderful with explainations that made perfect sense and were easily repeated by me. Timber has responded much quicker than I expected and no longer pulls at the lease. Sitting is still not his favorite thing but he will do it. I am so happy with the results and with Joanne! What a difference a day makes! Our dog is only 2, but we should have had Joanne come sooner. Our boxer is easily trainable, which helps, but it was me that really needed the training. Joanne addressed all of my concerns and shared with me the key words and body language needed to communicate with Scout. I work with him everyday, and he continues to improve. It's nice to know that Joanne is available if a problem arises. Thanks for changing our family life for the better. I'm a happy dog owner who feels confident about walking him and introducing him to others. Worth the investment!!! Joanne was great. We learned so much in the first session. Even before she had left, we were amazed that by a few changes in our behavior how quickly the dogs responded to what we wanted them to do. Joanne did a good job explaining the program and the training techniques as well as guiding us while doing it. I love that the training is based on tools you have with you all the time and not treat based or using shock collars. With Joanne's support, I believe our dogs are on thier way to better behaviors! Joanne was amazing! She explained everything to me in a way that I would understand. We only covered a portion of our needs with our dogs so far, but I could see improvement already after our first session. We wish we would have known about Bark Busters sooner ! My dogs are no longer fighting. They are cuddling together and love each other! We've seen so much improvement with Bud and would recommend Joanne to our family and friends !! I was very impressed to see immediate responses from both our dogs being trained. There has already been great improvement in our puppy and her behavior. We are very surprised and pleased with how quickly Winnie took to the training tips. Winnie was aggressivley barking at everyone outside of our immediate family and any noise would scare her. Before the first visit from Joanne was over, I saw an immediate improvement in her behavior. We are a little more than a week past our first appointment and she is a completely different dog. She is much more relaxed and seems happier. We highly recommend Joanne! Very effective training. It is working, but really this is a big change for our Charlie. But, if we do everything Joanne says, he will learn. Joanne is very experienced, thoughtful and kind.